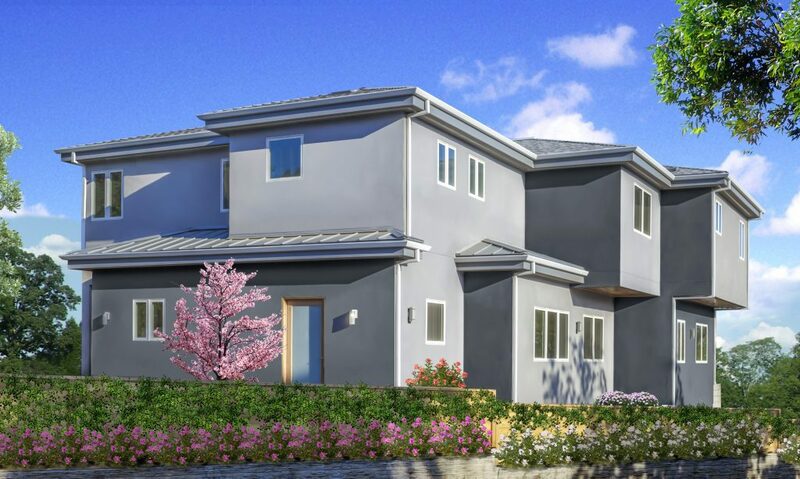 Our Design-Build system offering a one-stop resource of all inclusive services (Architecture, Engineering, Permit Processing, General Contracting/Construction and Supervision),was commissioned from Clients whom desired a new home in Los Angeles, that is a five bedroom/six bath custom home. The design leans toward Modern, with warm, crisp Contemporary finishes and an open floor plan layout inclusive of Private Office, large Kitchen with eight foot island, high volume entry with two skylights, extra wide glass doors to the outdoors and a play area for the children that can be observed from other areas of the first floor. The lot had an existing one story 85 year old home, that was demolished, after Environmental Company testing and abating of lead and asbestos materials, leaving the natural grade of earth underneath as a base for our palette of new three dimensional forms to evolve from. This site was somewhat challenging, with an irregular shaped corner lot and varying slopes. The initial engineering work required our soils engineer to drill down approximately 20-25 feet deep and take soil samples at intervals, for laboratory testing and evaluation, that was then utilized by our structural engineer, for foundation designs. 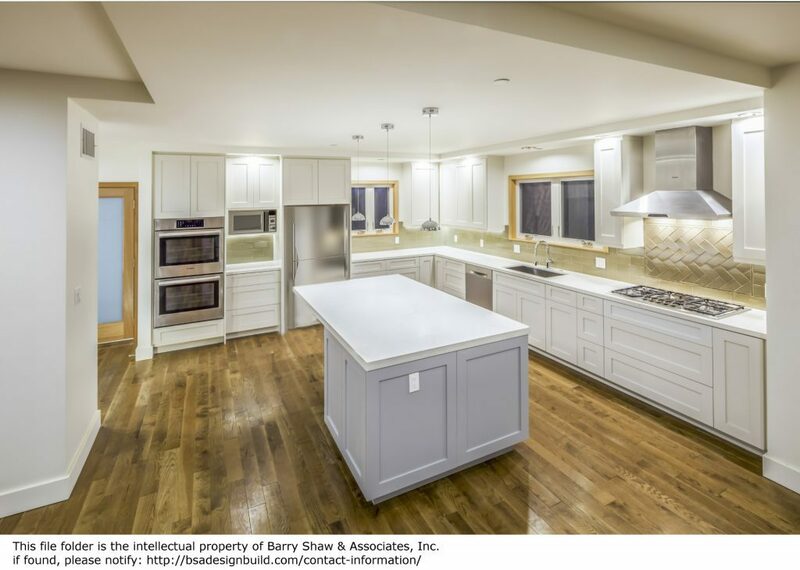 Our architectural designs incorporated extensive Feng Shui requests/requirements from our Client’s for the entire home, “Barry is very responsive and patient!”. For instance, the second floor master bed could not be located over a heating device (i.e. the kitchen cooktop or double oven on the first floor below); the foot of the bed of all Bedrooms could not face a door (bathroom, entry nor closet); and needed to face one of two specific Cardinal directions. Additionally, we incorporated: coffered ceilings; solid 3/4″ pre-finished sustainable wood flooring; personalized wood moldings; solid core select grade interior wood doors with clear satin finish; under cabinet LED lighting illuminating the custom herringbone tile detailing at the cook-top; paint/stain color sample and analysis; white laminated exterior and interior glass doors at selective locations; standing seam (50) year metal roof; Marvin casement windows; multi-color exterior plaster walls with night lighting placed strategically and top quality, functional, virtually maintenance free, material specifications for the rest of the home as well. Also, our ‘Healthy Home’ indoor environmental considerations were incorporated into the construction of the house, inclusive of: low VOC paints and stains; vacuum swept stud bays for entire home preface to encapsulating with drywall; compost recycling; dual glazed windows with argon gas insulation; recessed low voltage led lighting on dimmers; water conservation plumbing fixtures inclusive of hybrid gas/electric water heaters optimizing utility resources; roof slope and direction to accommodate future solar panels; entire building including interior walls and intermediate floor framing is insulated for thermal and sound considerations; high efficiency dual zoned hepa HVAC system and future electrical vehicle provisions to the garage. Exterior site/grading requirements were worked on concurrently with the home construction, via our Design-Build format. This included a 120 foot long retaining wall and extensive cut/export/re-grade/slope work of the site, to accommodate drainage needs. Stairs, landings, and storm water planter provisions, were provided as well, “We have been thoroughly impressed with Barry’s professionalism and expertise”. BSA is the 1st Los Angeles General Contracting firm to be licensed for 30 consecutive years, with the Principal also an Architect, ensuring seamless integration of design and construction, that results in a timely (“Barry has been indefatigable in pushing this project forward in a timely manner”), cost effective and quality home! 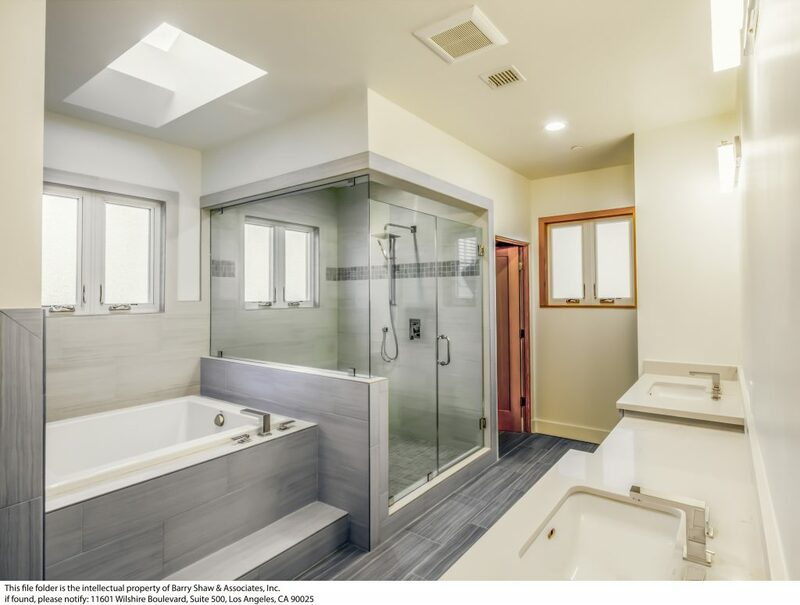 This home was completed in 2017 within 1% (less) of the estimated design and construction costs and is inclusive of: architecture, engineering, consultants, general contractor overhead and profit and supervision fee. Additionally, this project was completed approximately three weeks ahead of schedule. Our in-house Design-Build system and (30) years of building experience, was utilized to achieve these successful results. Our (10) licenses in multiple States of California, Colorado, Hawaii, Idaho and Texas, provides us with the flexibility to utilize our proprietary Design-Build system on a site of your choice. Let us know what type of project you have in mind and where that may be? The Best For You Always!